Host Just Act at your venue. We will create a piece tailored to your organization. Customized Forum Theatre Residencies are perfect for organizations with a mission to serve a diverse population. We create a customized expirience with/for your community that will transform shared concerns into invigorating, interactive theatrical dialogue. We collaboratively develop programs with groups & organizations for their communities — from young adults to seniors, non-actors & actors alike—to transform shared concerns into invigorating, interactive theatrical dialogue, combatting powerlessness in the face of injustice by co-creating and trying out new tactics for making real change. It can be applied to all kinds of work committed to social action and transformation—educational, political, creative, cultural and beyond. This training will bring out your ability to overcome societal and self-imposed limits in order to better include and interact with others. Flip the Script: From Fear to Courage was everything I needed without even knowing it. As a theater person who does social justice work, I was thoroughly impressed with the activities we participated in. They were fun, engaging, and extremely thought provoking. There were moments in which I felt as though I was in a therapy session having a safe outlet to express all the mixed emotions that come along with having multiple identities. I would recommend the Just Act crew to all who are interested in social justice with a new creative spin. The People’s State of the Union PSTOU is a national civic ritual and participatory art project created by the US Department of Art & Culture (USDAC) to bring people together through story circles to share our perspectives on the state of our union, stories of a time when we felt a sense of belonging, and/or experiences that inspired us to take action in that particular year. Stories are recorded and sometimes meshed by local poets into a creative response to the PSTOU. In 2017, Just Act put our spin on this project: After the small group story circles, the Just Act Ensemble synthesized several stories that were shared with the full room into an instant Forum Theatre piece so that the audience could have embodied practice in changing the ‘state’ to one of equity and justice for all. 2019: “Just Act, Go Vote,” on tour. Contact Just Act to collaborate with us. @Faith and Spiritual Affairs Conference: Health Justice Through storytelling, movement and theatre improvisations, participants will identify and interrogate the scripts that crop up and prevent us from authentic interaction and create barriers to personal and community healing. Come experiment and courageously visualize the world you want by practicing making changes to daily interactions and growing more healthy responses to conflict. Collectively and individually–joyfully, humbly facing fears that have resulted from systematic oppression–we will identify and rehearse practical solutions for transforming our realities for more equitable relationships and community interaction. A customized program brings Just Act’s many decades of Theatre of The Oppressed Diversity Training to your students, citizens, team, or office. Programs are shorter than residencies and can last a day, or several. We work with your population to address their unique needs and develop new and powerful ways to create cohesive understanding between members of your diverse space. 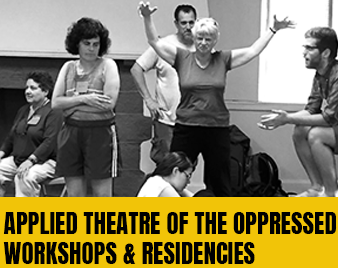 Just Act’s customized residencies delve deeply into the problems facing your community culture by delving deeply into their unique needs using Theatre Of The Oppressed Training as our tool set. Residencies are longer in length than programs. Programs may last several days to a week, however a residency aims to develop and teach the customized tools that your community needs to create log lasting systemic changes that support diversity within an organization. Engage in self and relational transformation that will support your efforts back at your home sites of changing collective patterns of action and thinking, as well as transforming structures. We will guide you through the experiential learning process we utilize for noticing and investigating inner and outer work, with curiosity. How these aspects, as well as how we ‘read’ the non-verbal body language of others, inform the action choices we make.